There are lots of reasons to like dragonflies. A great reason to like them is that they are voracious eaters of mosquitoes. Another is that they are one of the most skillful fliers in the animal kingdom: with their two pairs of parallel wings, they can hover or fly in any direction, even backwards or side-to-side. Dragonflies are also one of the fastest flying insects; they reach speeds up to 34 mph (a famous entomologist, Robert John Tillyard, claims to have observed one dragonfly flying at 60 mph). Their speed and agility makes them awesome aerial predators. A dragonfly captures its prey by forming a basket underneath its body with its six, hairy legs. It uses this basket to scoop mosquitoes and other insects out of the air and then the dragonfly eats its prey while flying. Dragonflies also have amazing vision. Each compound eye has up to 3000 facets. And each facet of the eye is facing a slightly different direction allowing a dragonfly to see in almost every direction at the same time. Dragonflies are able to see more colors than people, with their vision extending into ultraviolet frequencies. The hobby where people try to spot birds is called birding. There is similar hobby in which people try to spot butterflies, called butterflying. But the hobby where people try to spot dragonflies is NOT called dragonflying. 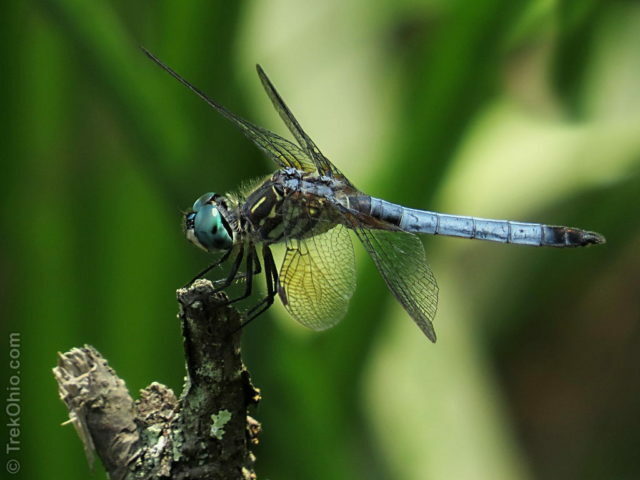 Instead it is called oding after the Latin name for the order of dragonflies: Odnonata. And a person who does oding is called an oder. Hot, sunny days are the best days to go oding. Join me as I go on a summer oding expedition at the Wahkeena Nature Preserve in Fairfield County, Ohio. 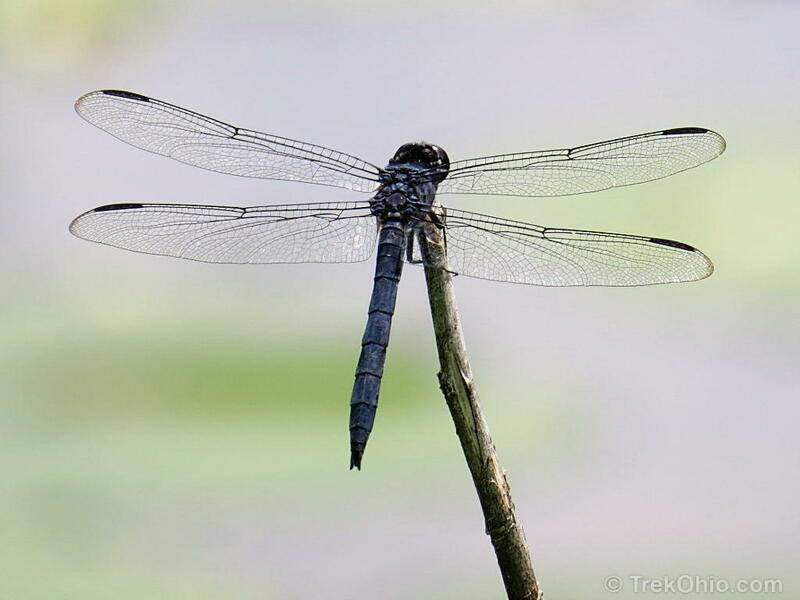 The photo above shows the same species of dragonfly that appears at the top of this post: the Slaty Skimmer. It is distinguished by having a black head with an almost uniform bluish-black body. For this reason it is sometimes called the “blueberry dragonfly”. The wings are almost entirely clear with the exception of a little, black mark near the top, outer edge of each of its four wings. These little, black marks on the wing are called, stigmas. You can tell this is a male dragonfly because of the two, little, black things sticking out the tail-end of the dragonfly. These are called claspers and the male dragonfly uses its claspers to hold on to the female while mating. It turns out that the coloration of the female is completely different, but I only managed to photograph the male. The male Slaty Skimmer is easy to photograph because of its behavior. It periodically patrols its territory, but comes back time and again to the same perch. Once you realize which stick or reed the dragonfly favors, you can focus your camera on this perch and wait for the dragonfly to return. 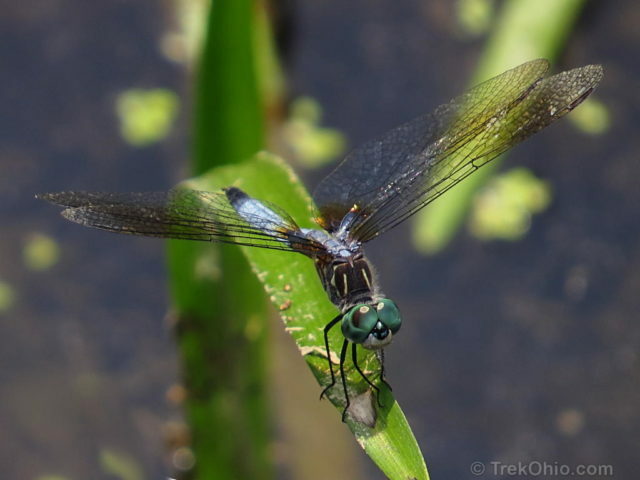 The Blue Dasher pictured above is also a male (note the claspers at the end of its tail). The males have a milky blue tail or abdomen. The chest or thorax makes me think of a tiger. 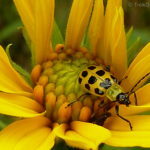 It has black and yellow stripes. The eyes are green. The wings are almost clear, but there’s a bit of an amber tint where the wing joins the body and also farther away toward the wings’ tips. 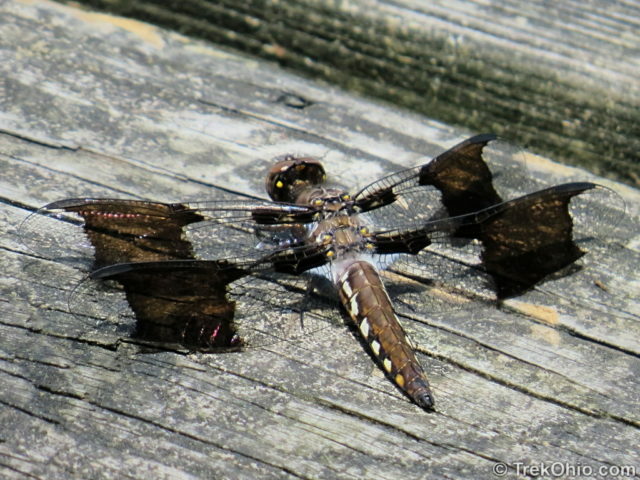 It also has black stigmas (the little black marks) on the outer edges of the wings that we saw in the Slaty Skimmer. 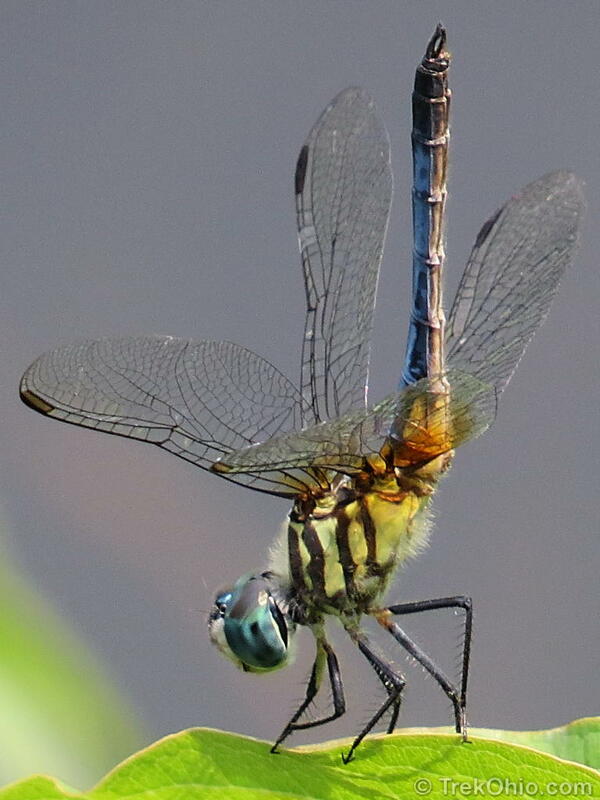 From this perspective, you can better see the amber tint in the Blue Dasher’s wings. The Blue Dasher sometimes adopts a posture in which its tail points straight up. There is actually a name for this; it is called the obelisk position. 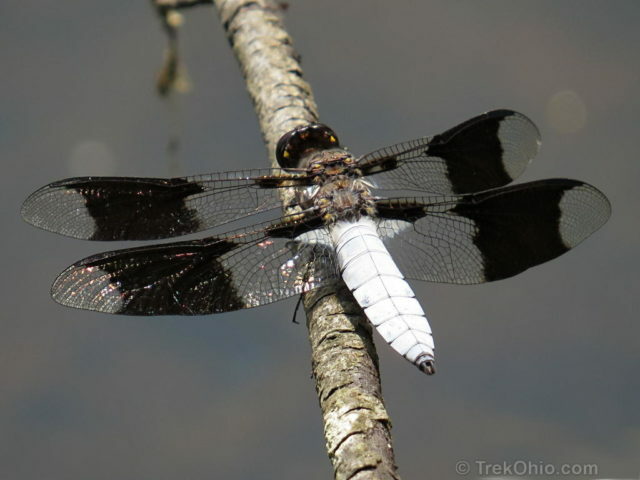 The obelisk position helps reduce the amount of sunlight striking the dragonfly’s abdomen, so it is used by the dragonfly to help cool its body temperature on hot days. A Blue Dasher poses in the obelisk position to help keep itself cool. 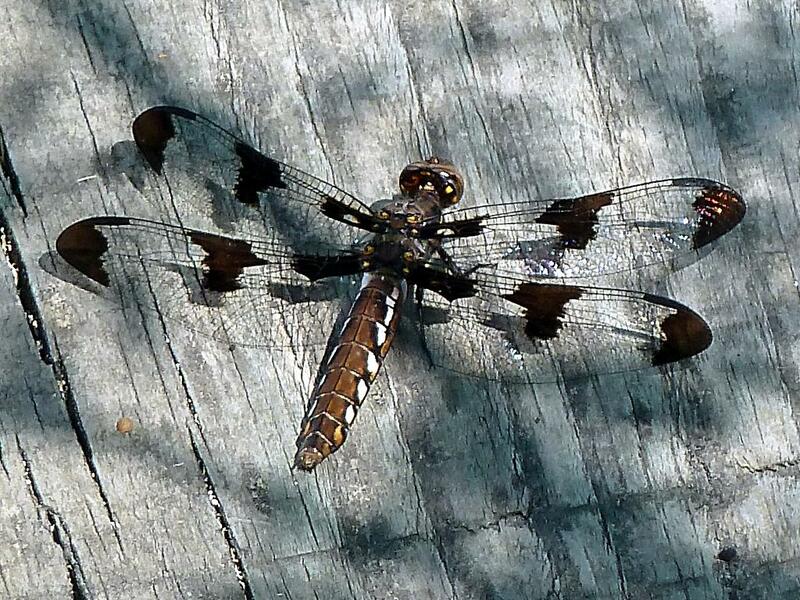 This dragonfly appearing in the above photo has to have one of the easiest names to remember: Common Whitetail. This one also has claspers, so it is a male. Besides the broad, white tail, it also has conspicuous black bands across the middle of each of its wings. 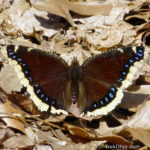 There’s a little bit of black near the top of each wing next to the body, and the hindwings also have a splash of white where they meet the body. The Common Whitetail is difficult to photograph because it is all too easy to overexpose that blazing, white abdomen. In the above photo I have adjusted the exposure value by -0.67EV, but I probably could have underexposed it even more. As is the case for a number of dragonfly species, the female Common Whitetail looks completely different. Her photo is below. To begin with, the female Common Whitetail (pictured above) does not have a white tail. She has a brown tail with light-colored marking down the side. The light-colored markings are supposed to look bluish, but I really can’t see that. Her wing pattern is also different. The immature male has a tail like the above female, but his wing pattern looks like that of the mature male. You can see a photo of him below. You might think that the above photo is a Slaty Skimmer like the one that we saw at the top of this post, but it is not. The Slaty Skimmer is a bluish-black, and this one is a much lighter, powder blue. The claspers on the Slaty Skimmer are black, and on this one they are an off-white. Plus this one has a splash of green on its back between its wings. It turn out that the one above is an Eastern Pondhawk. A number of dragonfly species have the name, hawk in their name because they are aerial predators like birds of prey. 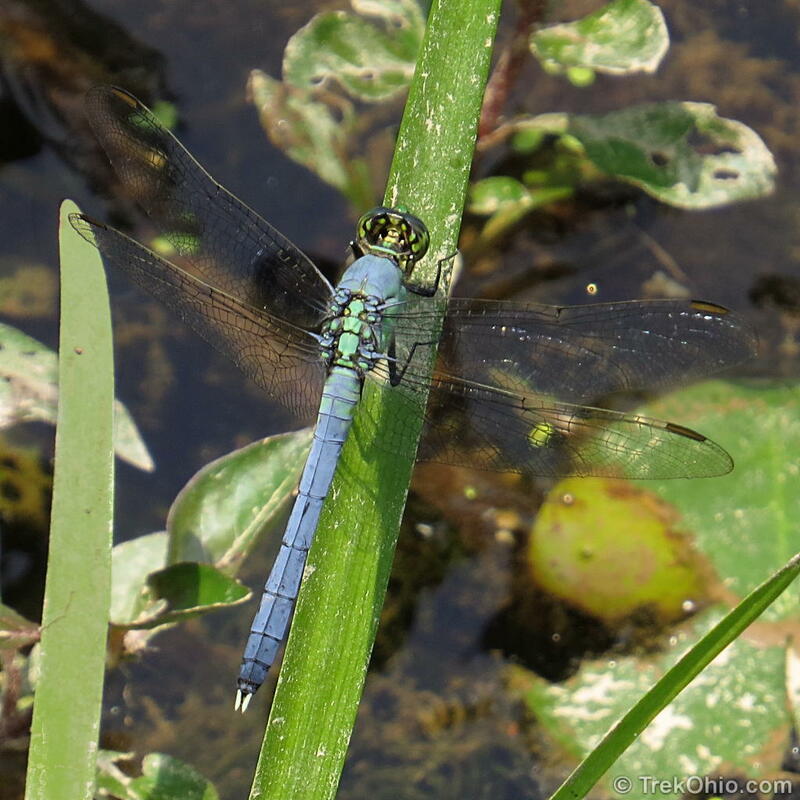 Surprisingly the male Eastern Pondhawk doesn’t start out being a light blue color. Originally it’s colored much more like the female, and over time it changes colors. This is true for a number of dragonfly species. Could it be that the female’s coloration is better camouflage? That’s what I’m inclined to think. 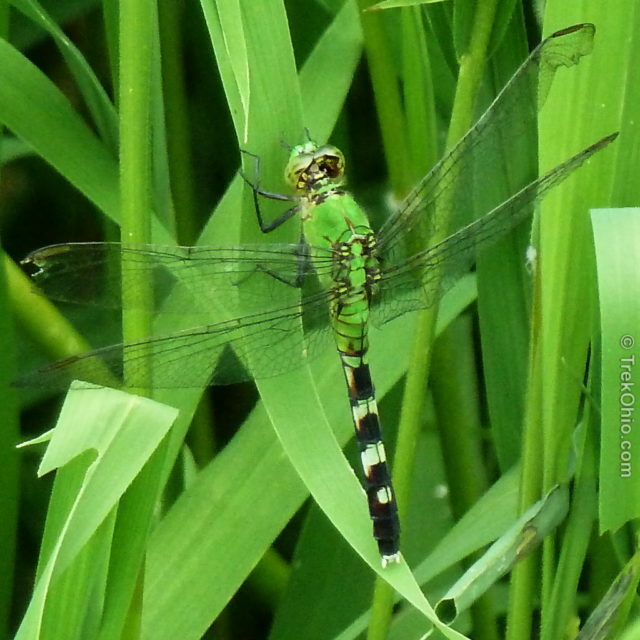 Here is a photo of a female Eastern Pondhawk that I took elsewhere. The final species that I photographed at Wahkeena was the Widow Skimmer pictured below. 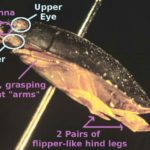 In the above photo, note the two-pronged claspers that let you know it is a male. 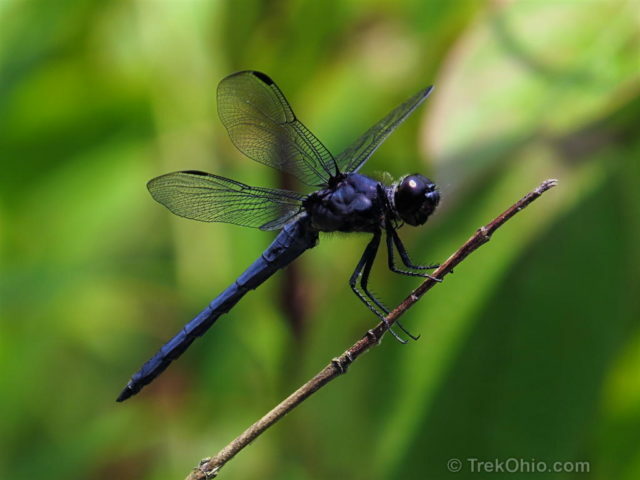 The tail of the Widow Skimmer starts out a steel-blue and becomes lighter as it ages. Near the body of the dragonfly the wings are black with a white band crossing the wing about midway. Widow skimmers get their name because the male leaves the female as soon as she lays her eggs (making her a “widow”). In most other dragonfly species, the male tends to hang around the female after she lays her eggs. I was able to photograph the five species of dragonflies at Wahkeena Nature Preserve in about 15 to 20 minutes time on the boardwalk there. It was fun. All the photos were taken using maximum telephoto on my point-and-shoot camera. I highly recommend using a monopod or walking stick to hold the camera steady when zooming all the way out. I like using a monopod or walking stick more than a tripod because it is easier to bring along while hiking, and if you are trying to take photos of moving, living things, you can change its position rapidly in response to the animal’s movement. Although the above photo shows the camera mounted to the stick, I usually just hold the stick and brace the camera against it. If you would like to go oding, you will find dragonflies near streams, rivers, wetlands, ponds, lakes, and even meadows. One of the features that I like about looking for dragonflies at Wahkeena nature preserve is that their little boardwalk passes through a pond with lots of reeds and sticks for dragonflies to perch on. Here’s what the boardwalk looks like. 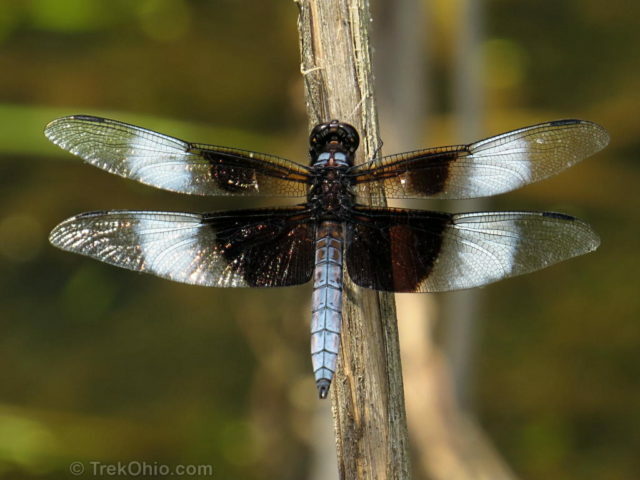 After I got home with my photos I used a booklet that I downloaded from the website of the Ohio Department of Natural Resources (ODNR) to identify the dragonflies that I photographed. It is included in the links below beginning with “ODNR”. Best wishes to you on your oding adventures! 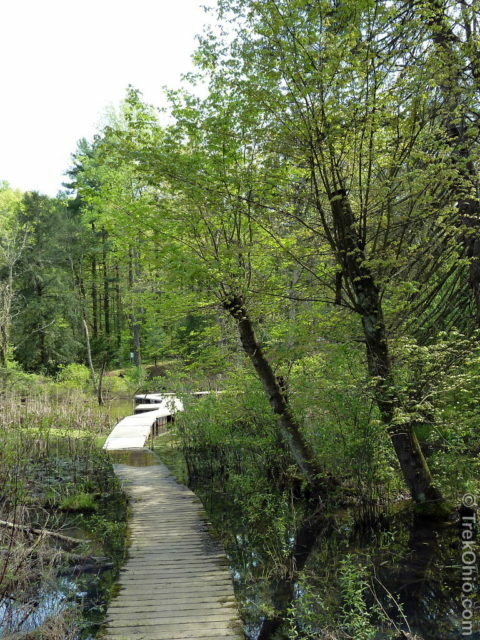 TrekOhio: Wahkeena Nature Preserve — Describes this park and how to get there. TrekOhio: Fairfield County Parks & Nature Preserves; this is the county where Wahkeena is located. This page contains links to Wahkeena’s official site and blog, plus other parks in the county. Share the post "Dragonfly Photo Safari"
thanks for the post, i really like it, very helpful and the pictures are very good. Thanks for this post, I learned a lot today! I knew nothing about dragonflies except how pretty and fun they are to watch zipping around, and somehow I knew they wouldn’t hurt you (as a little girl I remember). Beautiful captures, well done oding! Hi Deb – great post and photos! You’re definitely a top notch oder! All are awesome photos. Appreciate the info on the monopod. Thanks, Sheila! The monopod helps whenever I’m using my maximum telephoto, but it also helps with macro photography. When you stop to think about it, on macro if you move even a little bit after you’ve locked your focus, the picture won’t be crisp. And depending on how tiny the flower is, instead of using a real monopod I’ll even use a disposable chopstick. I hold the chopstick with my left fist and balance the camera on top of my fist. Or I’ll lean the chopstick back with my left hand, and balance the bottom edge of the camera against the stick. Thanks for sharing your experience. I will try both. Nice informative article and great pictures! Next you’ll have to try catching them in flight :). LOL. So far I have had no luck photographing them in flight. I wonder if there is some sort of trick to this that I don’t know? One trick is to stake them out at a stick they frequent. 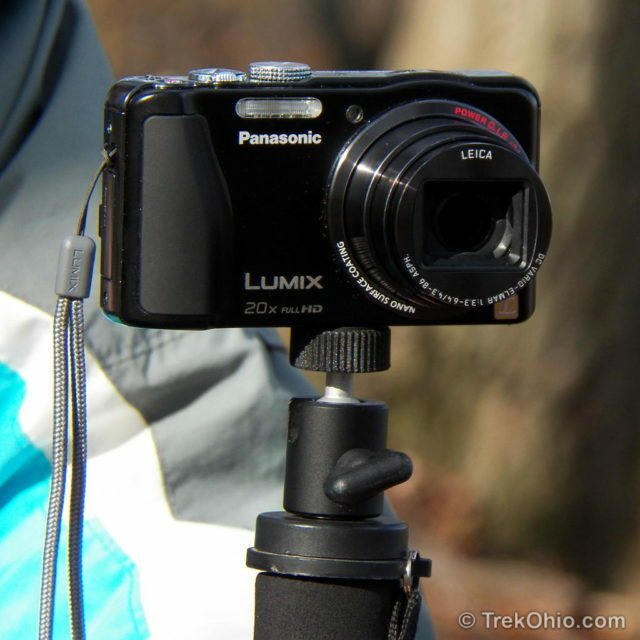 You can use a tripod and prefocus on the stick. Then use continuous shooting as they come in to land. If it’s prefocused you can take your eyes off the camera and watch for the dragonflies. I got some great shots of blue dashers divebombing each other using this method. It’s fun! Thanks for the tip! I’d love to get some photos of them in flight. I’ll try this out.